Any further information would be most welcome. More definite evidence has now come to light, thanks to Tim Colman, grandson of Joseph. Joseph was born in Leeds on 25th August 1892, the elder son of Joseph senior and Jane Elizabeth Marsland. His brother Harold was born in January 1896, and in 1901 they were living in Headingley, the father being listed as a hay and corn merchant. In 1905, when Joseph was 13, his mother died. On the 1911 Census Joseph senior is given as a traveller in oils, while both boys, having left school, are working as draper’s assistants. There is also a daughter, Clara, listed, aged 24, who had not appeared on the 1901 Census, and has, so far, not shown anywhere else. 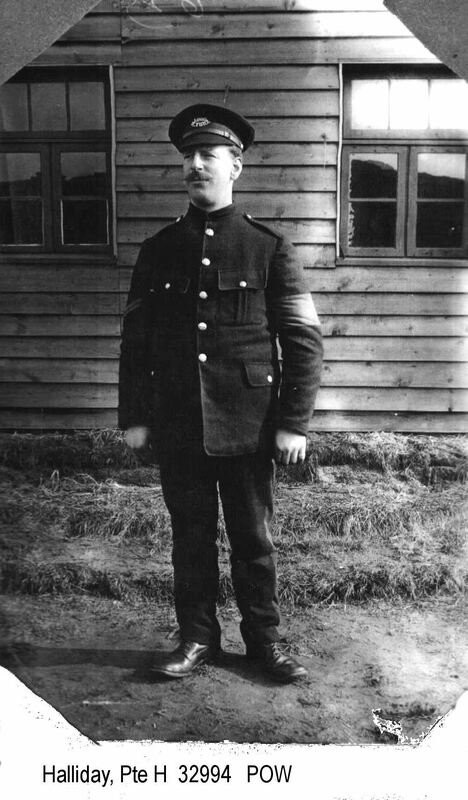 In 1914, when the war started, Joseph was almost 22, but only 5ft 3ins tall, and consequently too short to volunteer. 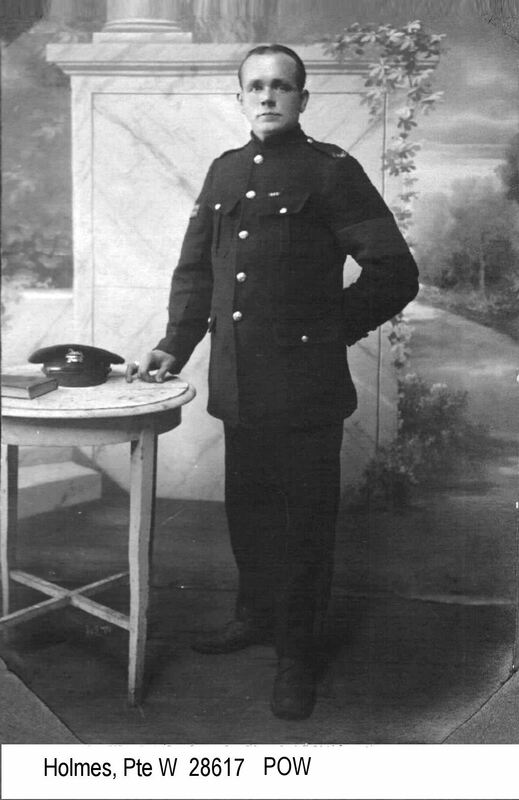 The Leeds Bantams Battalion was formed in December 1914 to cater for men like him, but in August 1915, when Joseph married Hilda Noble, his occupation was given as tram conductor, so he was presumably still a civilian. 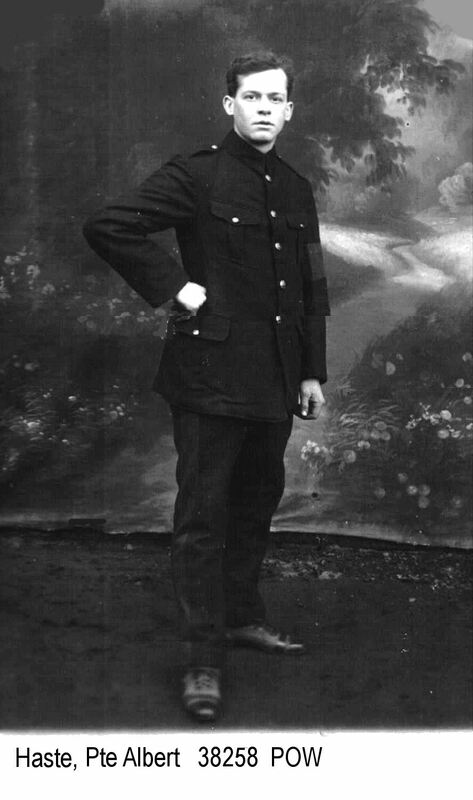 The reason for this delay in enlisting is not known, but by September 1915 he was in the army, and training at Clipstone Camp, near Mansfield, Nottingham. In February 1916 the battalion left for France, where they were put into trenches in quiet parts of the front, before joining the Battle of the Somme at Carnoy on 16th July. Fifteen days later they were withdrawn, having taken part in no official actions but having suffered 314 casualties, one of whom was Joe. He was sent back to England to recover, and found himself once again at Clipstone Camp. In April of the following year he returned to France, just in time for the German withdrawal to the Hindenburg Line. 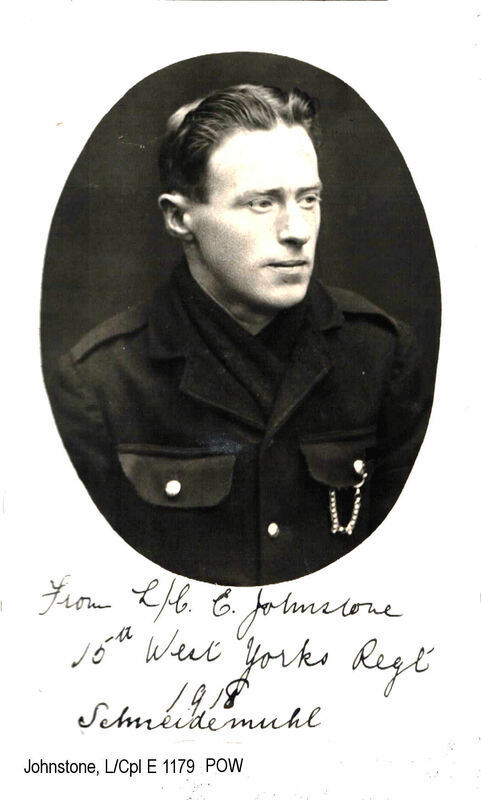 In August the battalion captured Gillemont Farm, but the Germans only withdrew about 30 metres, and at first light on 31st August, when the Bantams were holding The Knoll, just north of the farm, the Germans attacked once more, and Joe was wounded again, this time in the neck, and more significantly, was captured. He was one of the fifty-three listed as missing, but luckily not one of the sixty-three listed as dead. 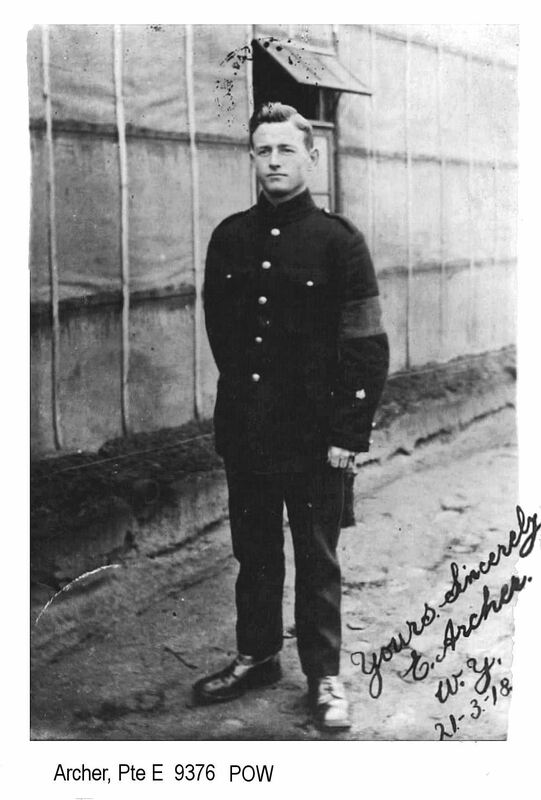 In October his father received an official postcard from Joe, telling him he was a POW at Cassel Camp and had been wounded, but was otherwise OK. He was later transferred to the camp at Langensalza, where he remained until the armistice, at which point the guards opened the camp gates and left the prisoners to make their own way home. He travelled through Germany and then Holland, finally reaching Rotterdam where he took ship for Hull. He arrived there about Christmas Day. En route he collected postcards of his journey, at least one of which he posted to Hilda to tell her he was nearly home. In February 1919 Joe was discharged and put into Class Z, a reserve which ultimately was not required. He was awarded the British War Medal and the Victory Medal, and, as noted above, he returned to Headingley and his job as a tram conductor. In May 1923 he and Hilda had a daughter, Jean, and some time after that it would appear another child, presumably Mildred, who was born in 1926, and became Tim’s mother. Sadly Harold had been killed in September 1916 at Thiepval, another casualty of the Somme, and Hilda lost a brother and a brother-in-law. Harry Levi was born in Burmantofts, in November 1897. He was the oldest child of Barnet, or Barnard, Levi and his wife Sarah. He had three younger brothers and a sister. His paternal grandfather, Louis Levi, had been born in Poland, then part of Russia, as had his wife Dora. They probably arrived in England, and Leeds, in the late 1860s, as their eldest, Barnard’s older sister Amelia, was born in Leeds in 1870. They lived in the Crown Point area, but when Barnard married he moved north of the river, first to Macaulay Street and then to Cuttell Street, both close to Mabgate in an area demolished just before the Second World War. After the armistice he was repatriated, but on 9th June 1919 he was recorded as having deserted. 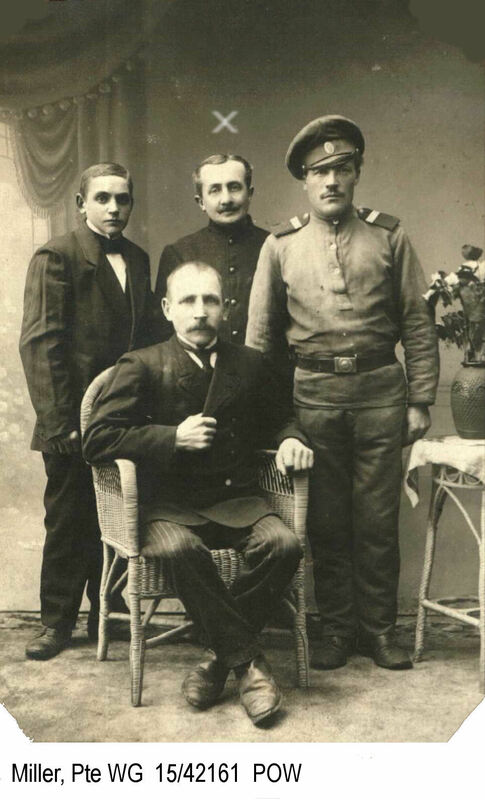 (Ancestry) His service records are missing so we do not have any further details, but desertion became a particular problem once the war had finished. Soldiers, whether they had volunteered or been conscripted, naturally wanted to go home as soon as the fighting was over, but demobilising several million men took time and organisation, something the soldiers did not appreciate, in either sense. A number of troop were still required anyway for various duties, including policing the occupied areas of Germany and clearing the battlefields. We have so far found only 14 Pals listed as having deserted, which is a very small proportion, and more than half of those did so after the armistice, so it was not a major problem for the Pals. 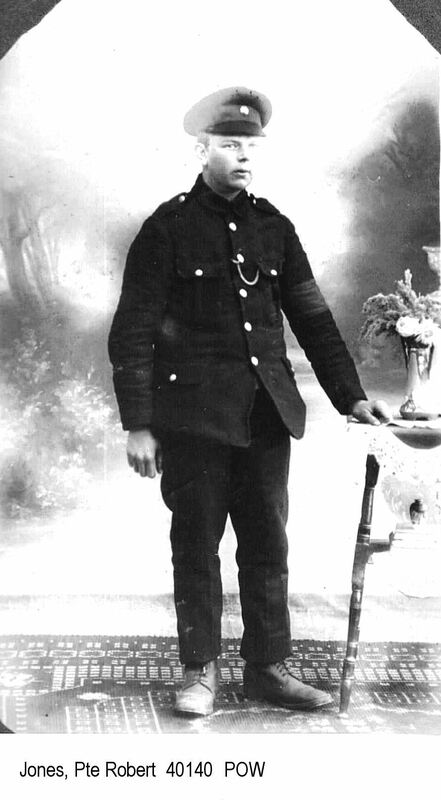 Robert Jones was born in Normanton in July 1896, the youngest child of Albert Jones, a whitesmith, and Eliza Ann Sugden, who had twelve children according to the 1911 Census, but only half of them were still alive at that point. His siblings were George, Albert, Martha, Frank, Jonathan, Sam, Maud, Alice, Florence, Eva and one other, not named on any of the censuses. Robert and Eliza married in Wakefield in 1873, and all their children were born there apart from Robert. In 1881 they were living in Gills Yard, and by 1891 they had moved to 15 Hope Street, next door to Joshua and Martha Craven, Martha being Eliza’s mother, having married Joshua also in December 1873. Eliza’s father had presumably died earlier. In 1901 they were in Normanton, living at 6 Exchange Street, where they stayed at least until after the war. Albert, Frank and Sam followed their father into the whitesmith trade, though Sam subsequently worked as a plate-layer on the railway. George was apprenticed to an iron moulder, and in 1911, when Robert was 14, he was listed as an errand boy for an ironmonger. He was also an uncle, to Edyth Alice Stables, his sister Martha having married James Owram Stables in 1901. She, sadly, was one of the six who died. (Census records from Find My Past) Robert’s service records have not survived, so we must surmise his army career. After the armistice he was released and repatriated. He was transferred to the Reserve List on 12th June 1919 and subsequently awarded the British War Medal and the Victory Medal. (Ancestry) After that I can find no record of him. 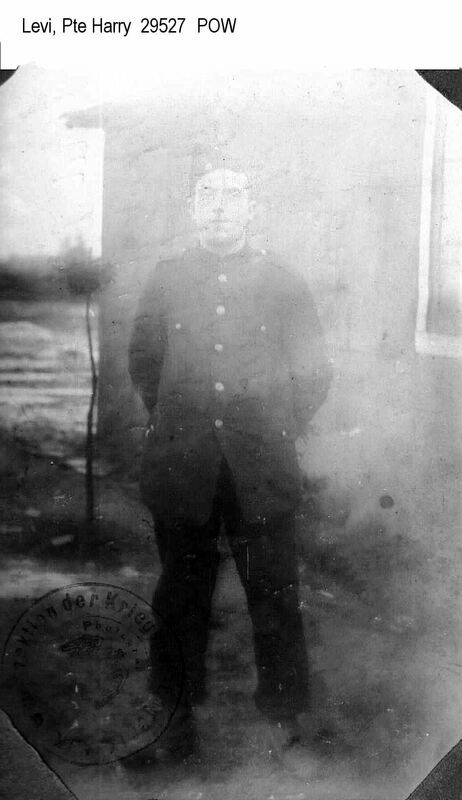 Whether that occupation was not a success we can’t say, but in January of 1915, when Ernest volunteered for the Pals, he gave his occupation as electrician, his address as 10 Pleasant View, Sharlston Common, and he was working for the Sharlston Colliery, who wrote a letter in February 1919 asking for a prompt discharge as they needed him back. On 5th December 1915 the battalion sailed for Egypt, where they were to guard the Suez Canal. But shortly before that Ernest went on an army cookery course, and passed the exam with a mark of 96%. Perhaps that links in with his earlier experiences as a publican. Their stay in Egypt was fairly short and uneventful, and on 7th March 1916 they sailed for France, ready for the Big Push. The next of kin was given as Walter’s father, but the Germans had trouble with his second name, recording it as Brack and Brake. They also weren’t sure about the spelling of the address, which was 16 Beaconsfield Terrace, and was in the village of Clayton, near Bradford, where Walter had been born and the family had always lived. Albert Haste was born in Rawdon in April 1892, the third child of William Haste and Eliza Bolton, who had married in 1887. He had two older siblings, John and Louise, one of whom had died by 1911, and a younger sister Alice. All the children were born in Rawdon, where they lived at 27 Canada Row. Herbert Edward Halliday was born in Bradford in November 1887, the third child of Charles and Mary Ellen Halliday, who, according to the 1911 Census, were married in 1884. Charles appeared on the 1891 Census, when the family was living at 35 Upper Mosscar Street, Bradford, but thereafter disappeared and I have found no death recorded. So perhaps Mary Ellen was correct when she was named as head of the family next time, but still married. Or perhaps she just misunderstood the question, though the 1911 return was filled in by Herbert with the same details. There were four children, Susannah, born in 1884, which ties in with the assumed marriage, George, born in 1886, then Herbert and finally Florence, born in 1890. After that there are apparently no more, which suggests Charles may either have died or left. Very little is known about Ernest. Only his medal records have survived, and these show that he enlisted first in the 2nd Battalion, a regular battalion, where he attained the rank of WOII. He then moved to the 1st Battalion, before finally joining the 15th, where, according to the photo, he was ranked as private. 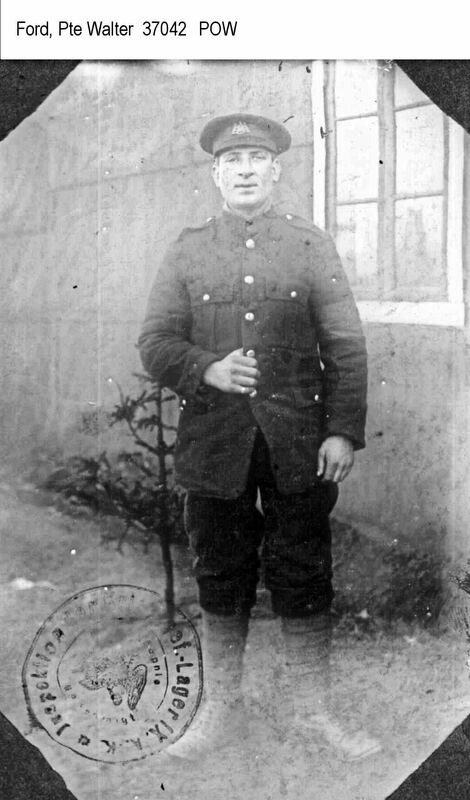 At the end of the war he was discharged and re-enlisted, being given the new Army Number 87268. He was awarded the 1914 Star, the British War Medal and the Victory Medal. Walter Ford was born in Burley, Leeds, in March 1892, probably the sixth child of Frederick and Sarah Agnes Ford. Frederick was a labourer from Suffolk, his wife from Burton-on-Trent. According to the 1911 Census they had six children, all living, but the 1901 Census lists eight, two of whom are gone by 1911. One of those was the eldest so she could have left home, but the other was more or less the middle child. I suspect they did not fully understand the questions on the census form. It also states that Frederick and Sarah had been married for 22 years but I have found no record of this marriage. The full list of children, from 1901, was Mary A, Frederick W, Sarah A, Albert, Percy, Walter, Edgar and Edith. In 1913 Walter left home. He married Marie Grice in the August, and they lived at 41 Langford Street. He was working for JP Blythe, butcher, in Burley View. On 27th March 1916 their son Percy was born. In 1914 the Great War began. Walter was 22 and married, but, it seems, did not feel the need to volunteer. Fortunately he is one of a relatively small percentage of men whose army records have survived. So we know that on 10th December 1915 he attested, possibly under the Derby Scheme, whereby a man could indicate his willingness to serve if and when needed, though by this stage there was little question of ‘if’. Walter was now suffering from gastritis and applied for a disability pension. He was assessed as 10% disabled and awarded a pension of 5/6 a week for one year. 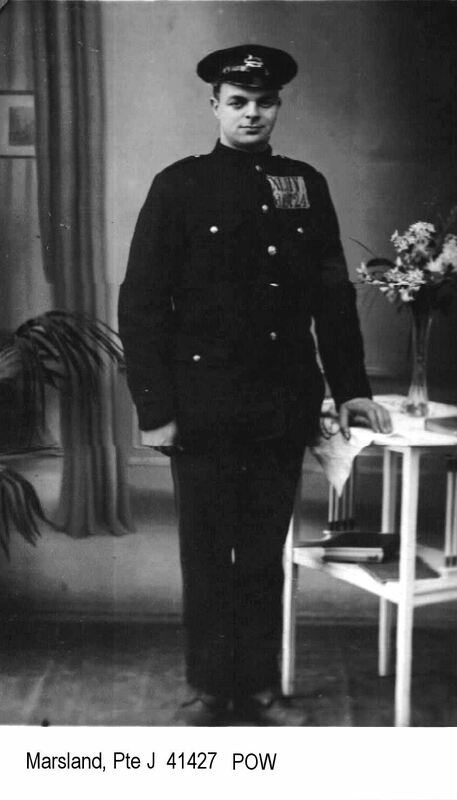 (Find My Past) He was also awarded the British War Medal and the Victory Medal. (Ancestry) I have not found him on the 1939 Register so he may have died before that.